Ever since Atty. 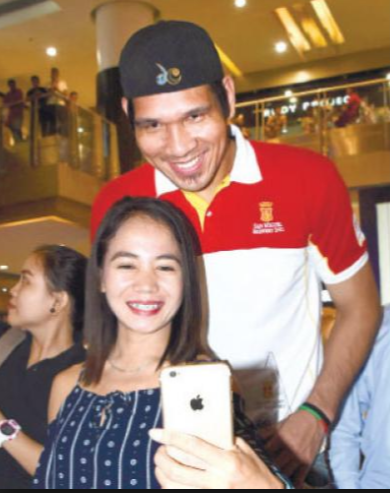 Estenzo spotted the San Miguel Beermen giant who was born in Compostela and who studied at the Pinamungajan Central School over a decade ago, the two have developed a father-and-son, counsellor-and-protege relationship. I spoke to the No. 1 draft pick of the Philippine Basketball Association yesterday. Standing tall at 7-foot-tall, he spoke with soaring confidence. Right now, Greg is one of those guys. Not just one of them — but THE number one — having been chosen first by Barangay Ginebra San Miguel. “Dream come true,” Greg added. When we talked, he was inside a gym. Noise rebounded off the background. I asked what he misses most about Cebu and the place where he earned triple-honors (back in 2008, when he led UV to its 8th crown, Greg was the CESAFI season MVP, the All-Star MVP and the Finals MVP — an unprecedented, may-never-be-broken feat). I was in Manila over the weekend. Attending the 32nd national anniversary of the Brotherhood of Christian Businessmen and Professionals (BCBP), the 4,000+ attendees crowded the SMX. What else did I see at SM’s Mall of Asia? A giant, glass-covered dome that will soon be one of the most hi-tech and applauded of coliseums in this continent. Mall of Asia Arena gleamed and sparkled when lighted by the summer sun. Workers installed roof beams. Maintenance staff wiped the see-through walls. Construction is at full speed. The reason? Barely a month is left before the long-awaited “We’re Open!” sign is hung from the entrance. On May 19, the 16,000-seating-capacity gymnasium will open. Two nights later, on May 21, it’s the concert of the concert queen herself, Lady Gaga. Sports? Ahhh. NBA exhibition games? Check. Nadal-Djokovic? Double-check (meaning, we’re hopeful!). UAAP and NCAA games? Check. This sports arena is long-overdue in Manila. The Smart Araneta Coliseum is 52 years old. That’s grandfather-age. It’s time for a world-caliber venue for sports and concerts. They have 31 of these Suites for rent. How much? They offer one- to 5-year leases between P9 to P12 million. Wow. Never mind the torrential rain and the bumper-to-bumper traffic last Saturday night heading towards the old Mactan Bridge, I traversed the main island and hopped towards Lapu-Lapu City. The destination? Hoops Dome. The occasion? “Fuel” against “Milk” when the Petron Turbo Blaze Boosters faced the Alaska Aces. Entering the 8,000-seater Hoops Dome right before the end of the First Quarter, the entire arena was filled. It was bumper-to-bumper seating. The fully-air-conditioned stadium was cool and warm. 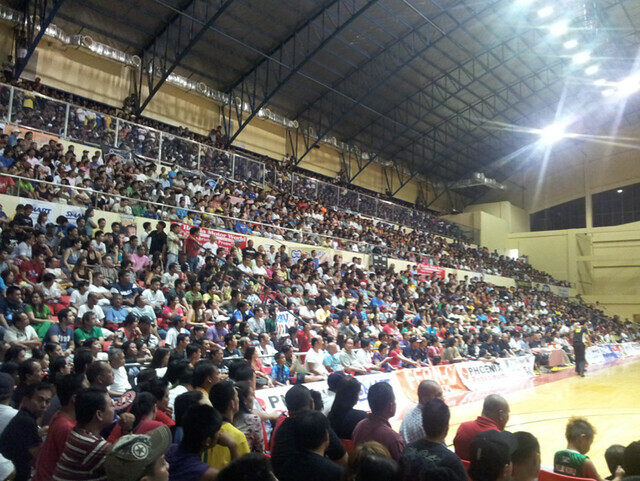 It wasn’t Cebu Coliseum-warm; yet, because of the jampacked setting, it wasn’t as cold as the SM Cinemas. 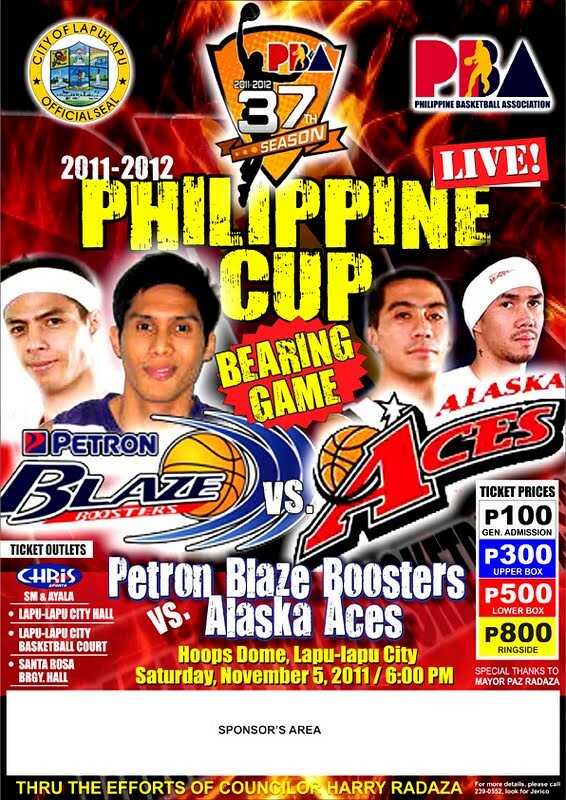 Alaska and Petron are two of the league’s most famous teams. The 25-year-old squad named Alaska, owned by the Uytengsus of Cebu, is the owner of 13 PBA championships—including a rare 1996 Grand Slam. Recently, the Aces were made famous by the abrupt departure of Coach Tim Cone, who’s led his men for the last 22 years (he still had years left in his contract before he moved to B-Meg Llamados). Shocking? Absolutely. Petron? They’re the reigning champs. In the last conference, they were underdogs against Talk ‘N Text. Aiming for a Grand Slam, TNT was denied the feat by Petron and Coach Ato Agustin. Last Saturday, what made the battle a must-watch was because this was a bearing game. Unlike previous exhibitions, when players wouldn’t jump their highest, this time, it was for real. Petron was on a three-game losing streak; Alaska lost five of their first six games. A Cebu victory was all-important. What happened? Arwind Santos of Petron was unstoppable. The Mark Magsumbol lookalike reaffirmed his MVP status; he’s lanky, quick, confident, well-rounded. I call him Spiderman. He pivots. He blocks shots. He fires the bulls-eye on that three-pointer. He’s the best man on the parquet floor. I liked LA Tenorio of Alaska. Diminutive at 5-foot-8 (compared to the 6’8” Jay-R Reyes), he would sprint from baseline to baseline looking like Ronnie Magsanoc. My only complaint? He’s not offensive. Not until the last few minutes did he shoot. Yes, a point guard’s first role is to pass—but when you’re a spitfire like LA, you’ve got to contribute. By half-time, Alaska led, 44-43. Yes. I hoped they’d win. But, it wasn’t to be. The entire second half was Petron’s. Joseph Yeo scored 27 points. Like Tenorio, he’s from La Salle. Eric Salamat, a hero of Ateneo, played for Alaska. The problem with Alaska is this: nobody wants to shoot. When they neared 80-82 with less than two minutes to play, nobody wanted the ball. Lack of confidence—that’s it. 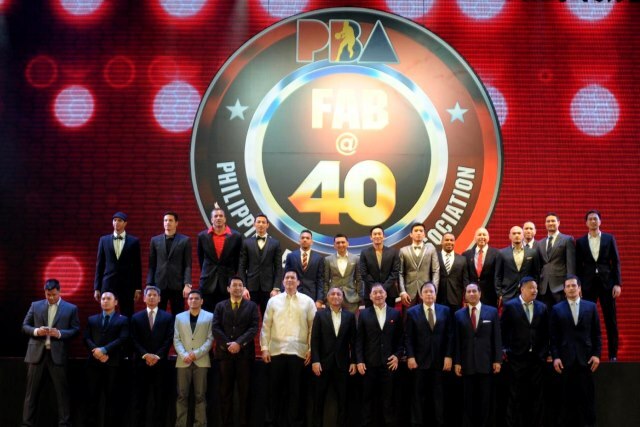 It was unlike Petron who had too many options: Yeo, Santos, Miranda, Ildefonso, Cabagnot. Alaska? Sonny Thoss was productive during the first half. 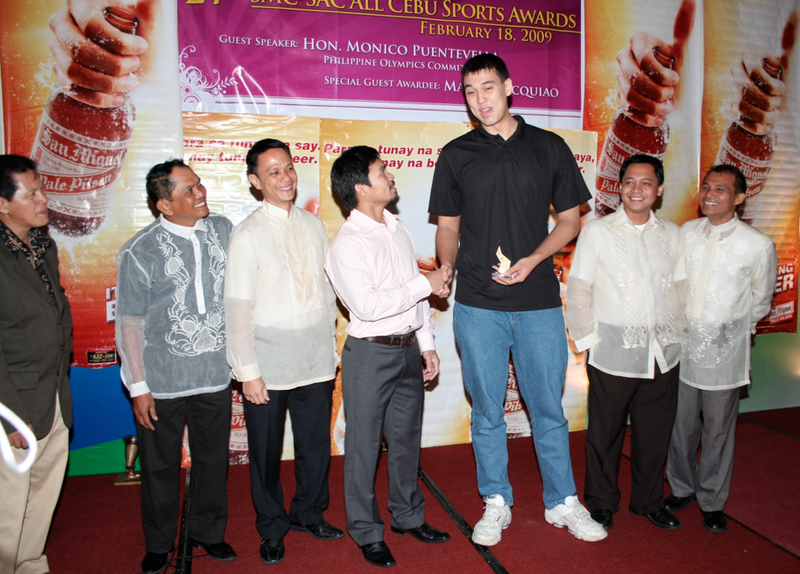 Tall at 6-foot-7 (I thought he was Greg Slaughter, with the same looks, build, moves), he could have been their superstar. Could have been… because he faded. While he top-scored with 19, he could have exceeded 30. Highlights? The one that excites the crowd most comes in-between plays. It’s the teasers. One is when a gift item is hurled towards the crowd via a slingshot. The spectators go on a frenzy. Another was a man who was blindfolded and given a ball to shoot. As expected, he missed and missed as Cebuanos laughed and laughed. One more was when two men played tug-of-war. Each was given a ball and, opposite each other, they’d push forward, trying to draw closer to their goal so they can shoot. It was fun. The only “dark” episode happened with 7:46 left in the 4th quarter. That’s when, amidst the blazing lights and reverberating music, all of a sudden… there was a blackout. It lasted about five minutes. Boos filled the dome. Cellphone lights flickered. This was, of course, a live TV5 telecast game. Oh no, we gasped. “There was a trip-off because of the additional ceiling lights,” Councilor Harry Radaza later explained. Nothing to worry, the lights switched on but not before a fan shouted, “Gituyo sa Alaska kay pildi na sila!” With the game on, Petron cruised to milk Alaska, 86-80. What a PBA finale! The drama started in Game One. 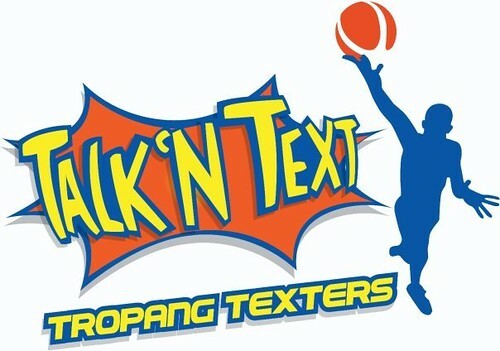 The Talk N Text Tropang Texters, winners of the first two PBA conference finals, aimed to win the third and final leg. This victory would have given them a rare ‘Grand Slam.’ In the 36-year history of the oldest professional basketball league in Asia—the PBA—only Crispa, San Miguel, and Alaska have achieved a Grand Slam. Talk N Text attempted. In Game 1, they won—and lost! Leading by a score of 84-75 with 5:11 left, the Texters also led by one point with three seconds left. But two-time MVP Danny Ildefonso calmly sank a 12-footer to win that crucial Game 1 for Petron. Score: 89-88. Since that game two weeks ago, the PBA Governors Cup Finals has been a yo-yo, roller-coaster-ride-like series. TNT tied the contest, 1-all. They led 2-1. They trailed 2-3. Then, they equalized at 3-all. Last Sunday, I watched Game 7. When I switched on the TV set, Petron led at the end of the first quarter, 28-17. They would not relinquish that lead. Even with Jimmy Alapag, the league MVP, dribbling the ball as point guard, the Tropang Texters trailed all the way. Even with MVP—that’s Manny V. Pangilinan—cheering from the bleachers, it wasn’t to be. Even with Monico Puentevella, the POC chairman, seated beside Mr. Pangilinan, history was not meant to be celebrated two nights ago. Petron, fueled by a blaze, put a brake on TNT. Petron won Game 7, 85-73. No loss is painless but this was excruciatingly painful for Talk N Text for several reasons. One, the rare Grand Slam bid was crushed. Two, they were expected to win. In the semifinal round, reports say that TNT purposely lost in one game to avoid a Final showdown with the Barangay Ginebra Kings. “Pinagbigyan nila kami at nagkamali sila,” said Ato Agustin, Petron’s head coach. Third, Petron had plenty of injured players: Jay Washington, Lordy Tugade, Rookie of the Year Rabeh Al-Hussaini, and Joseph Yeo. The pressure, possibly, was too much for the Texters. Trailing in the 4th quarter but with plenty of time left, they hurriedly threw 3-point desperation shots. They were jittery, intimidated, startled. They panicked. I guess this was to be expected: when a year-long Grand Slam bid trickles down to the last few minutes, one plays petrified. Petron? Petrified? No. The Blaze Boosters were relaxed and loose. They played to win—while TNT played not to lose. Petron’s import, Anthony Grundy, was dazzling. He top-scored with 26 points (after scoring just five in Game 6). But the best player was Mark Magsumbol. I mean… Arwind Santos, who looks like Mark Magsumbol. He scored 16 points. To top that, he rebounded 16 times! Imagine… 16 rebounds in one game. With 37 seconds left in the game, he even slammed the ball with two hands. That slam extinguished the Grand Slam dreams of TNT and MVP. Why was this Petron team no lightweight compared to the heavyweight, TNT? It’s because this team’s DNA is spelled S-A-N M-I-G-U-E-L. Yes. Starting only this season, San Miguel Beer relinquished its name (for the first time in PBA history) and gave way to the fuel company they own. Good move. And so, while this was a “first” for the rookie Petron, this was also the 19th championship of the team owned by Eduardo “Danding” Cojuangco, Jr. You can also conclude that, in a battle between sports titans (MVP v. Boss Danding), the older, more experienced sportsman won. Ato Agustin is the happiest Filipino today. He scored one of the league’s all-time biggest upsets—and did it as a rookie PBA coach. Above all, the biggest winners are the basketball fans. I, myself, admit to not watching closely the PBA. But with this series, I followed. It was a contrast in coaches, team owners, imports; an intriguing Grand Slam Quest versus Underdog’s Upset Try contest. In the end, between gasoline or SMS, fuel wins. Last Friday, on board Cebu Pacific and flying to Manila, there was turbulence in the air. My head shook. My face frowned. My mind trembled. It was hard to believe. No, the sky was clear and the wind did not howl–the jolt came from the Philippine Daily Inquirer article I was reading. 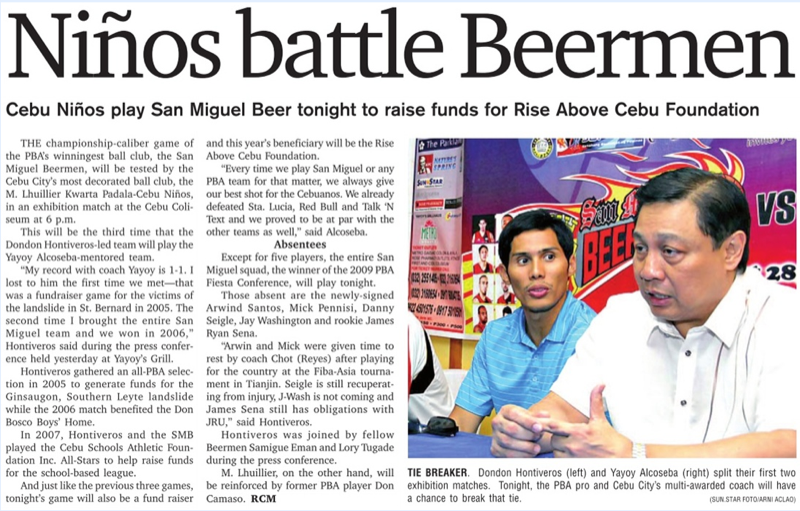 “While we recognize the inherent right of San Miguel Corp. to change the name of its San Miguel Beer team in the Philippine Basketball Association to Petron, we are certainly baffled over the name change,” wrote Nathanielsz in the very first paragraph. Starting next season, the SMB franchise has requested the PBA Board of Governors to change its name to Petron. There’ll no longer be San Miguel in the PBA. Why this perplexing move when the words “San Miguel Beermen” are not only the most famous but also the most historical?–leaves SMB loyalists baffled. Ronnie has a point. Although SMB has a losing record in today’s PBA second conference (one win/four losses), this short-term negativity has nothing to do with its positive, winning name. San Miguel to Petron? Studying further this issue in a few more websites, I noticed that this appears to be a purely business-driven decision. Phoenix Fuel, a Petron competitor, has purchased the Barako Bull franchise and wants to enter the PBA. This move by SMB (which owns a major stake in Petron) to change its PBA name to the oil giant will disallow Phoenix from joining the oldest professional basketball league in Asia. Why? Because the PBA rules, if I understood them well, state that no direct competitor of an existing team be allowed to join the league. Truly, this is an unusual move by Danding Cojuangco, Jr., Ramon Ang and San Miguel Brewery, Inc. Digging further into history (thanks to Wikipedia), the SMB franchise has been in existence since 1975. This was when the Philippine Basketball Association started. This was 36 years ago. In all, SMB holds the record for the most number of league titles at 18. To delete “San Miguel” from the pro league is bewildering. It’s like saying the L.A. Lakers will quit the NBA or the Celtics will change its name to the Boston Green Horns. It’s implausible. San Miguel is Pinoy basketball. Next year, his basketball franchise will celebrate its Silver Anniversary. That’s 25 years of dribbling and scoring trophies. It will be a mega-milestone for this team labeled as “the most successful Philippine basketball squad in history”—outside of the PBA. Will the year 2011, to celebrate its 25th birthday, be the moment when M. Lhuillier Kwarta Padala sends a remittance letter to PBA Commissioner Chito Salud with the words: “Money ready. Count as in.”? We hope so. 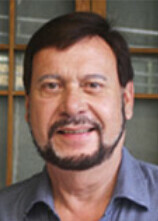 For Michel Lhuillier is Cebuano. He represents our land. Of French descent (he’s the Honorary Consul of France), the billionaire sportsman loves one city more than any other on earth… Sugbu. That conversation was 10 months ago. Today, has the business tycoon’s mind changed? Yes, Cebu hopes so. Because if M. Lhuillier does enter the PBA, it will be a first. A first for a Cebu-based company to battle—on the basketball floor—the big boys and multinationals of Philippine business. The PBA currently has 10 teams. These are Air21 Express, Alaska Aces, Barako Energy Coffee Makers, Barangay Ginebra Kings, B-Meg Derby Ace Llamados, Meralco Bolts (new team), Powerade Tigers, Rain or Shine Elasto Painters, San Miguel Beermen and Talk ‘N Text Tropang Texters. Add the words “M. Lhuillier Kwarta Padala” to this list? I called Yayoy Alcoseba. This was two nights ago. Ever the serious and disciplinarian maestro on court, he was light-hearted and relaxed in our talk. He has reason to smile. Last Sunday, his Kwarta Padala team won again. That’s nothing new. They always win. But this was different. “That was the most difficult championship we’ve ever won,” said Coach Yayoy, who’s collected for the team hundreds of golden trophies. The Cebu City Councilor, now on his third and final term, explained how difficult it was winning the Tournament of the Philippines (TOP). “We had to go and fight in Cagayan de Oro… we had a thrilling Game 5… it was our most satisfying victory,” he said of the 78-76 tournament-ending win of the Cebu Niños against the MisOr Meteors at the Cebu Coliseum. “Are you ready to move to Manila?” I asked. “I’ll just be team manager!” he said, laughing. That’s true. From the moment the M. Lhuillier team was formed, one man was there. Sir: Time to try the PBA? 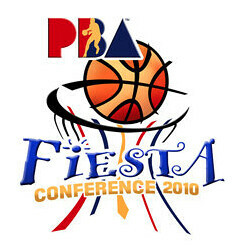 The Philippine Basketball Association is the second oldest basketball league in the world, next only to the NBA. Since its inception on April 9, 1975—coincidentally, my third birthday!—it has become the most revered of games in our basketball-crazy nation. In Game One of The PBA Final played last Friday, Alaska was supposed-to-be tired and weary, having just escaped Talk ‘N Text in a seven-game semifinal. It didn’t show. They beat San Miguel, 89-83. What a shocker. And for several reasons: (1) The SMB squad are the defending champions; (2) Alaska lost to them twice during the regular season (95-89 on April 11 and 85-74 last June 26); (3) Alaska had not beaten SMB in their last six tries, dating back to 2007; (4) Alaska was on a losing streak in The Finals: six straight defeats. Yet, Alaska prevailed in round one. Then, Game 2. Two nights ago. San Miguel Beer—an original member of the PBA since 1975 and the winningest club in history with 18 PBA titles—fought to avert a 0-2 deficit. Their coach, Siot Tanquingcen, only 37 years young, deployed Joseph Yeo and import Jay Washington to produce the numbers. They did, scoring 20 apiece. But the Beermen played catch-up all night. Alaska led in the first quarter; SMB tied the game. Alaska took the lead; again, SMB crawled back. It was the same back-and-forth, see-saw pattern.. until the last minutes when Alaska—having gulped milk instead of beer—sprinted towards the finish line first, winning, 94-90. I enjoyed the game. LA Tenorio, only 5-foot-8, was savvy and alert. Arwind Santos banked several against the board. My favorite play was the one of the tattoo-laden Alaska import Diamon Simpson who, at the end of the third quarter, backed up against his defender then leapt for a monstrous, in-your-face slam of a dunk. Alaska played inspired basketball. And when the pressure intensified in the game’s dying moments, they were relaxed and composed, especially at the free throw line—making seven of eight in the last 77 seconds and, for the whole game, shooting 84 percent—an extraordinary statistic that would shame Shaq. Cone, now 52 years old and the winner of 12 PBA titles for the Fred Uytengsu-owned company, is hungry for this win. Thanks to the controversy last February 5, when Talk ‘N Text walked out of their game against Barangay Ginebra, my interest in the Philippine Basketball Association has intensified. Remarkable showing by the Purefoods Tender Juicy Giants. Having been down 1-2 in their best-of-seven semifinal series against San Miguel Beer, the Giants won three games in a row and, thus far in the KFC PBA Philippine Cup Finals, they’ve won another three straight. That’s 6-of-6. Will it be Lucky 7 when Game 4 is contested tomorrow? Alaska Milk, highly-touted to have provided tough resistance to Purefoods, has faltered. In Game 2, they shouldn’t have lost. Leading by 13 points in the third quarter, they stumbled. Now they’re in a deep, dark hole. Can they win their first game? And, after that, maybe one more? To seize the momentum? Can they score four straight when no team ever in PBA history has come back from a 0-3 deficit? Improbable. That’s as unlikely as Joshua Clottey scoring a knockout win versus our Filipino flag-bearer next Sunday. But here’s a fact: A former University of San Jose Recoletos star player, a Cebuano named Roger Yap, has been the playoff’s best. “‘He was really the brightest star who played with an incredible will to win,’ said Gregorio of Yap, who was named the undisputed KFC/Accel-PBA Press Corps Player of the Week for the period Feb. 15 to 21, quoting the official website PBA.com.ph. I’ll make an admission: I don’t follow the Philippine Basketball Association like I used to. 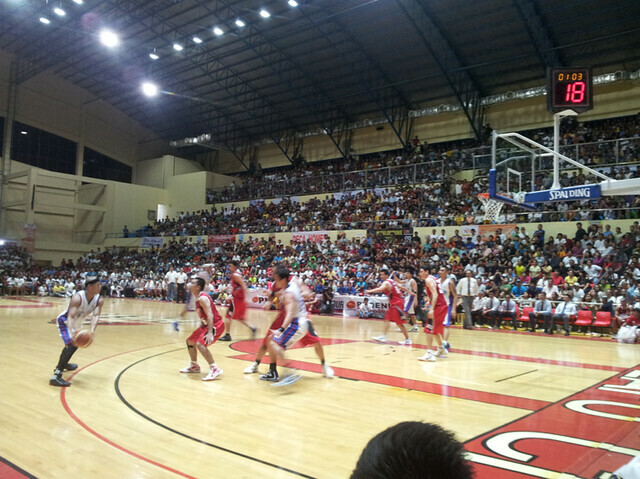 I’ve watched several out-of-Manila, here-in-Cebu games. Back in the 1980s, I adored Allan Caidic’s three-pointer and reminisce his rivalry against Samboy Lim. Even my dad’s younger brother, Rey Pages, donned the Crispa Redmanizers jersey. And so, yes, I did follow the PBA—but not anymore. That changed a couple of nights ago when I watched the most awaited finale of the season: Game 7 of the Motolite-PBA Fiesta Cup Finals between Barangay Ginebra and San Miguel Beer.